With two weeks to go before my new book hits the stores, folks in Mecklenburg County, Virginia – where the story is set – are getting a sneak preview. 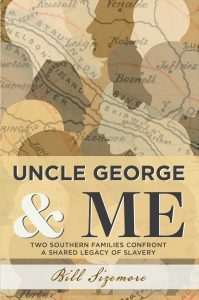 The Mecklenburg Sun, a scrappy weekly newspaper in Clarksville, just published an excerpt from Uncle George and Me: Two Southern Families Confront a Shared Legacy of Slavery. It tells the tale of how I discovered the forgotten history of my family’s slave-owning past and linked up with Uncle George Sizemore, the 98-year-old patriarch of a family that descended from my ancestors’ slaves. This Sunday, August 26, I’ll do a book talk and signing at the Clarksville Regional Museum, 801 West St., at 2 p.m. I hope to see many Mecklenburg friends and neighbors there. The book goes on sale to the public September 5. Watch this space for further details. I’m pulled in by this excerpt! I would love to read the entire book. Will you have some available for purchase on Sunday? Yes! Hope to see you there.